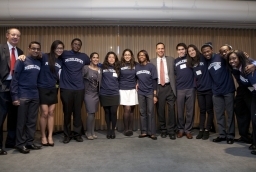 President Ron Liebowitz, Dean Shirley Collado, and trustee Chuck Gately welcomed a Posse group from Chicago in 2012 (above). The new STEM Posse cohort, arriving in 2015, will come from Los Angeles. MIDDLEBURY, Vt. – Starting in the fall of 2015, Middlebury College will offer full-tuition scholarships annually to 10 urban students pursuing careers in science, technology, engineering, and math (STEM) through an expanded partnership with The Posse Foundation. Middlebury was one of 10 institutions recognized at a White House ceremony today for participating in the initiative, which will fund 500 Posse scholars over the next five years. According to The Posse Foundation, which identifies, recruits, and trains public school students with leadership and academic potential, this recent initiative to recruit new STEM partner institutions was launched in response to a challenge issued by President Obama and First Lady Michelle Obama. With $70 million in combined support from participating institutions, the Posse STEM program is one of the largest scholarship announcements in the past decade for urban students pursuing STEM fields. The Posse STEM scholars will be recruited in the fall of 2014 and matriculate on campuses the following year. Middlebury has hosted a new Posse group from New York each year since 1999. In the fall of 2012, the College added a second Posse group from Chicago. With the addition of the STEM group in 2015, which will be drawn from students in Los Angeles, each class entering Middlebury will include three Posse cohorts–approximately 30 students per class. “Our partnership with Posse is one of many efforts we have in place to increase Middlebury’s overall diversity, and it’s an important one,” said Shirley Collado, dean of the college. Collado, a former Posse scholar herself, says the initiative will help the college toward its goal of diversifying students in STEM-related majors. Middlebury was the fourth institution to form a partnership with The Posse Foundation, which now has agreements with 51 undergraduate institutions and 10 graduate programs. The Posse Foundation is one of the most comprehensive youth leadership development and college access programs in the country. Posse recruits outstanding student leaders in Atlanta, Boston, Chicago, D.C., Houston, Los Angeles, Miami, New Orleans and New York, and sends them in teams (posses) to some of the most selective colleges and universities in the country. 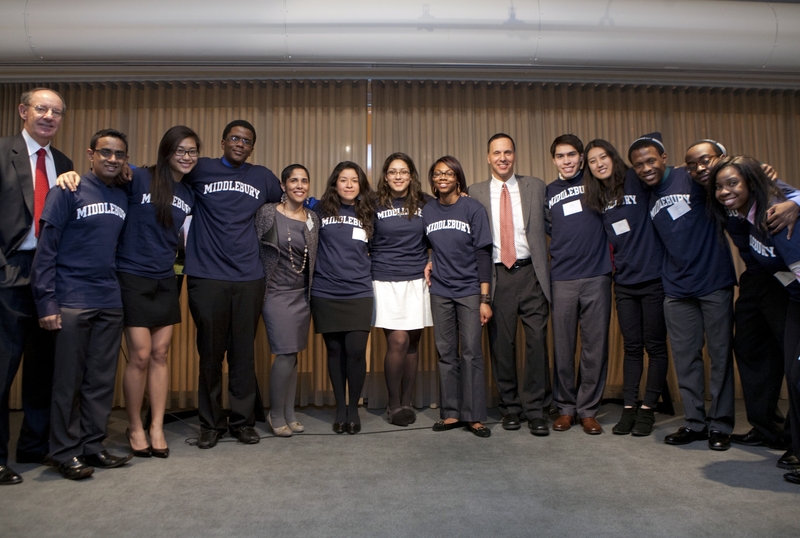 This year Posse received close to 15,000 nominations for 660 scholarship slots. Posse began in 1989 because of a student who said, “I never would have dropped out of college if I had my posse with me.” “Posse” at the time was a term used in youth culture to refer to one’s group of friends or support system. This simple idea became the basis for a national program that today supports urban, college-bound public school students with exceptional promise and potential for leadership. Since its inception, Posse has sent close to 5,000 students to college. These Scholars have won more than $575 million in scholarships from Posse’s university and college partners. Most important, they are persisting and graduating at a rate of 90 percent—a rate that well exceeds the national average and equals or exceeds the average graduation rates at most selective colleges and universities in the United States. More than 70 percent of Posse Scholars either found new campus organizations or go on to become presidents and officers of already existing ones. A recent survey shows that 41 percent of Posse alumni who have been out of college for two or more years have either completed a graduate degree or are currently in graduate school.